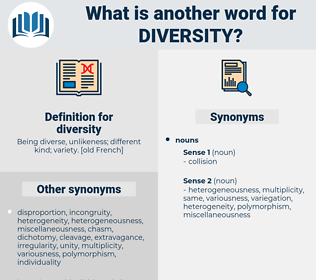 What is another word for diversity? determinants, differentiation, variation, multiculturalism, assortment, discrepancy, wealth, versatility, differential, multilateralism, inequality, mosaic, disagreement, complexity, mix, differing, co-education, cross-section, plethora. variety, diverse, diversification, diversified, richness. multiplicity, plurality, variety, disparity, variability, divergence, multitude, diverse, diversification, breadth, variance, specificity, richness. analogy, fixity, equivalence, fewness, equality, continuance, identicalness, homogeneity, unchangeableness, parallelism, Equivalency, paucity, similitude, persistence, conformity, homogeneousness, uniformity, correspondence, fixedness, constancy, accordance, community, steadiness, congruity, alikeness, permanence, firmness, resemblance, identity, invariability. No difference of soil - no diversity of climate - no diversity in the original settlement of those two States, can account for the remarkable disproportion in their national advancement. Still, as there is great diversity of opinion, among persons of equal worth and intelligence, a mutual spirit of candor and courtesy should be practiced. deforest, diffract, divaricate, depressed, defrost, de forest, divorced, deprecate, day of rest, depreciate.